Sense of wonder is the lifeblood of science fiction. When we encounter something on a truly staggering scale—metal spheres wrapped around stars, planets rebuilt and repurposed, landscapes re-engineered, starships bigger than worlds—the only response we have is reverence, admiration, and possibly fear at something that is grand, sublime, and extremely powerful. 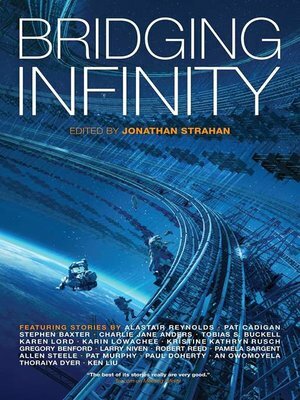 Bridging Infinity continues the award-winning Infinity Project series of anthologies with new stories from Alastair Reynolds, Pat Cadigan, Stephen Baxter, Charlie Jane Anders, Tobias S. Buckell, Karen Lord, Karin Lowachee, Kristine Kathryn Rusch, Gregory Benford, Larry Liven, Robert Reed, Pamela Sargent, Allen Steele, Pat Murphy, Paul Doherty, An Owomoyela, Thoraiya Dyer and Ken Liu.